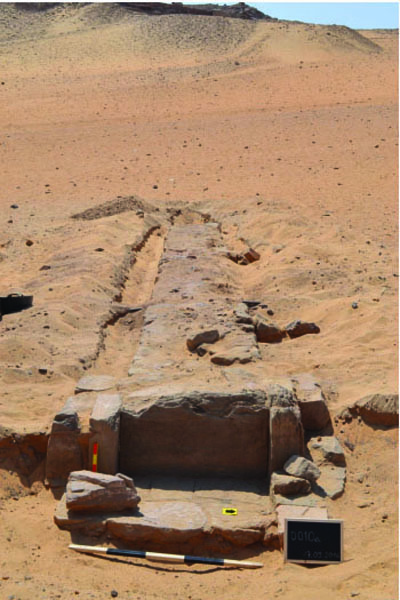 During excavation work at Aswan's Qubbet El-Hawa necropolis, a British mission from Birmingham University and the Egypt Exploration Society uncovered a causeway leading to the tomb of Sarenput I, the first Middle Kingdom nomarch (provincial governor) of Aswan's Elephantine Island. Mahmoud Afifi, head of the Ancient Egyptian Antiquities Department at the Ministry of Antiquities, told Ahram Online that the newly discovered causeway is considered the longest ever found on the western bank of the Nile in Aswan, stretching for 133 metres to connect the tomb of Sarenput I to the Nile bank. 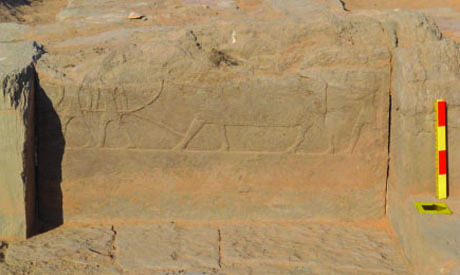 Afifi explains that the causeway is decorated with engravings, the most important of which are found on the eastern part of the ramp's northern wall and depict a group of men pulling a bull and presenting it as an offering to Sarenput I after his death. Hani Abul Azm, head of the central administration of Upper Egypt, told Ahram Online that the mission has also unearthed a collection of clay containers from a pit within the causeway, which archaeologists believe are canopic jars used in mummification. Abul Azm said the containers will be studied, along with the organic materials found inside, in an attempt to better understand the mummification process. The mission's field director Martin Bommas says he is very enthusiastic about the discovery, describing it as "a wonderful success that could change the original features of Qubbet El-Hawa area." Bommas asserted that the mission will start a comprehensive study on the ramp in order to reveal more of its secrets, which may open up the opportunity to comprehensively explore the Qubbet El-Hawa area, which houses a collection of tombs of high officials from the Old Kingdom and nomarchs from the Middle Kingdom. Sarenput I ruled Elephantine during the reign of King Senusert I of the 12th dynasty. He held several other titles such as the overseer of the priests of Satet and the overseer of foreign lands, among other positions. He was also the king's personal trading agent for goods from Nubia. His tomb is composed of three rooms connected by hallways. The first two chambers hold colonnades, while the innermost chamber has a niche that once housed a statue of the owner. The outer reliefs depict Sarenput with some of his relatives and his dogs, while the surviving inner paintings depict a scene of the owner with the god Khnum.